We always have a box laying around. In most rooms. And who’s the culprit? Not me……it’s my husband. Poor guy. But once again, I found something to cover and spice up a bit. Yep, it’s true. Here’s another quick/scrap-using project. Do you like these kinds of projects? I do. ***I used upholstery type fabric, so it was pretty thick. You can use cotton too but just use some fusible interfacing to make the fabric thicker, so it keeps its shape better. Then, cut 1/4 inch slits at a diagonal from each corner of this rectangle. Then fold these flaps to the underneath side and pin into place. Sew all the way around the inner edge of the rectangle to keep the flaps in place. Then sew all of your side pieces together along the 6 inch side, with right sides together. Then, clip little 1/4 x 1/4 inch squares out of each corner of your top piece. Now, you’ll pin your top piece to your side piece, with right sides together. Fold the little square opening together at the sides, creating a square corner as you pin. Do this to all 4 corners and sew into place. Now, turn the cover right side out and fold the bottom edge under a 1/4 inch and then another 1/4 inch and sew into place (adjust or trim if you need to before folding bottom edge under). Iron as best you can to make your edges sharp and crisp. 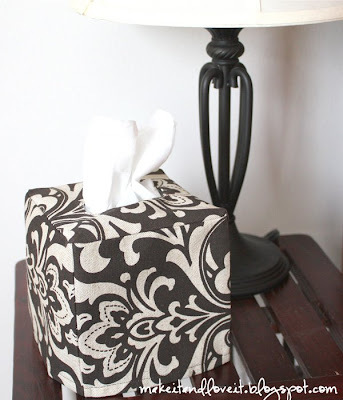 Slide over your tissue box and proudly display your little creation! I cannot believe how often you come up with new and fun projects! You are sure amazing! Is there anything in your home not covered in fabric? Very stylish by the way. Oh this is way cute, I love it! I’ll be linking. Clever! Look at you! Such a smarty! I love your site. My little guy keeps me very busy and I’m in the middle of a move, so I have yet to make anything, but my sister does all your projects….so I have an idea for you… You know those hand towel things that you hang on your refrigerator door to wipe your hands on? Well, I was thinking, you could probably design a super cute one to attach to the towel? You’ve got to be running out of ideas right? Or are you that creative?!! I’m jealous! You are so talented! A friend just sent me to your site today and I’m loving it! Shantommy…….ooooh, I’ll have to think about that one. Hmmmmm…. Thanks. And yes, sometimes I think, what else could I make/change? But then someone offers an idea (thanks!) or I see something that I’d like to duplicate. And as weird as it sounds, I have a list of ideas that is always growing and changing. So I can always resort to that too. I just made this one and I love it. I am making three more in the short rectangle boxes. I thought I would throw out the dimensions I did in case they were helpful. Top piece 9 1/2 by 51/4 and the sides 5 1/4 and 41/4 (2) and 9 1/2 by 4 1/4 (2). What a great idea! Absolutely love it. I do love using up my left over pieces. Just made a couple of these with some spare fabric. Thanks for the pattern! thanks for the tute..I'm going to make this right now..thnks again for sharing u'r knwoledge.. Thanks!! I made a couple of these last night, and they really liven up my bathrooms. I did laugh as I was making them, thinking that I was actually making covers for my kleenix boxes, but they're great!! Love it! Thanks for the great idea. I love the way it looks! It is amazing how something so simple can make you so happy! I’m making these to give to family members to encourage more eco friendly lifestyle for all of us. Since you’re so creative, could you figure out a way to fold hankies in the box so that when we’re done with our tissues we can refill our boxes with hankies? I love the easy way you attach the top to the sides by cutting out the notches!!! I’m just discovering this site & I must say that you are simply Genius! All your posts & projects are very inspiring & I absolutely LOVE the way you recycle things & that you explain really well with lots of pictures & make everything look super simple! I have an 18 month old boy & am dying to try out some of the stuff from your blogs. 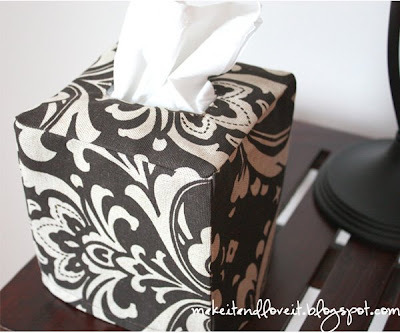 What a clever idea – I have several of these tissue boxes around the house and wanted exactly the type of covers for them that you have made. Here I go then with my sewing machine, scissors, thread and lovely different colour materials. Thanks so much!